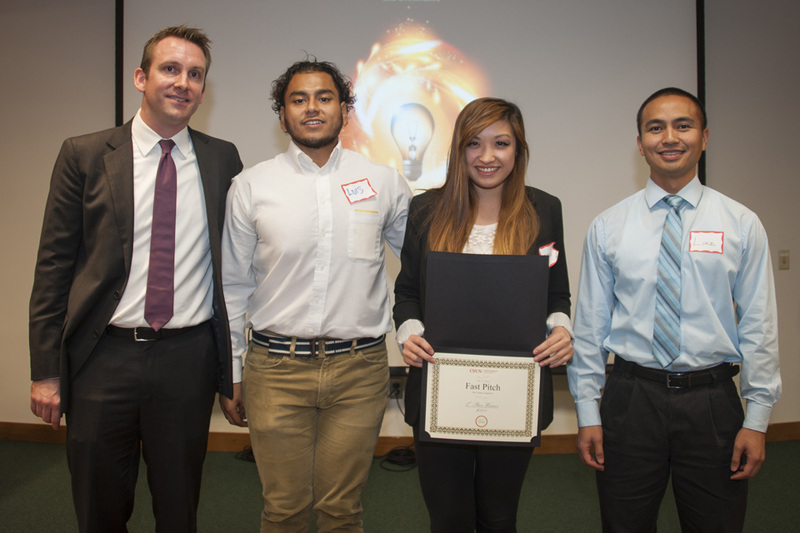 CSUN Students Edgar Limon, Arvin Flores, and Jasmine Beeman stand alongside Entrepreneurship Program Director Ryan Holbrook (far left) after winning the first place prize of $2,000 for their smart script internet code idea. Photo by Luis Garcia. 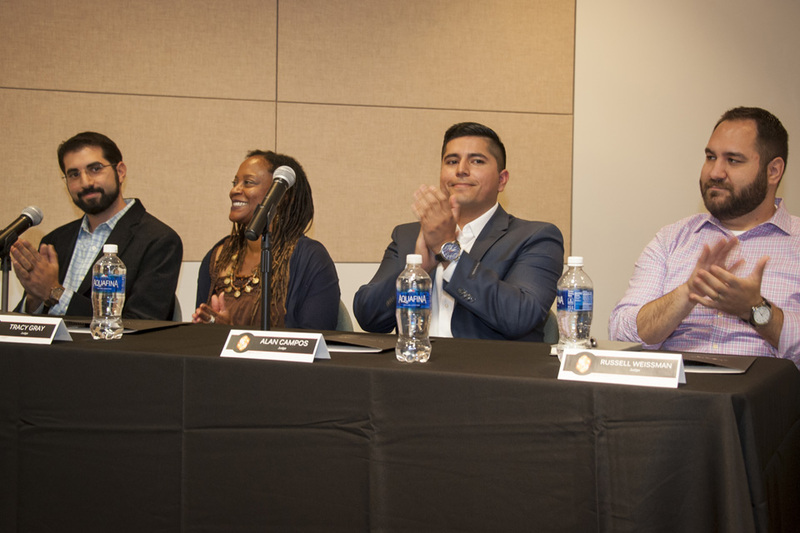 Tracy Gray, Ash Sobhe '10 (Information Systems), Alan Campos '16 and (Business Law) and Russell Weissman ’06 (Cinema and Television Arts) judge the second-annual Fast Pitch competition. Photo by Luis Garcia. Steven Van Alen wins $1,000 and second place for his Sleepy Head mattress and topper idea. Photo by Luis Garcia. CSUN Students Luis Turcios, Carrie Huang, Denise De Sequera and Luke Rimando take home the $500 third place prize for their Fit Us mobile workout app. Photo by Luis Garcia. Ash Sobhe ’10 (Information Systems), one of four judges for California State University, Northridge’s Fast Pitch “elevator pitch” competition on Nov. 15, had a bittersweet time judging the event. “Part of me was really excited seeing the ideas these young entrepreneurs had, and the other part of me was jealous I wasn’t one of them out there,” Sobhe said. 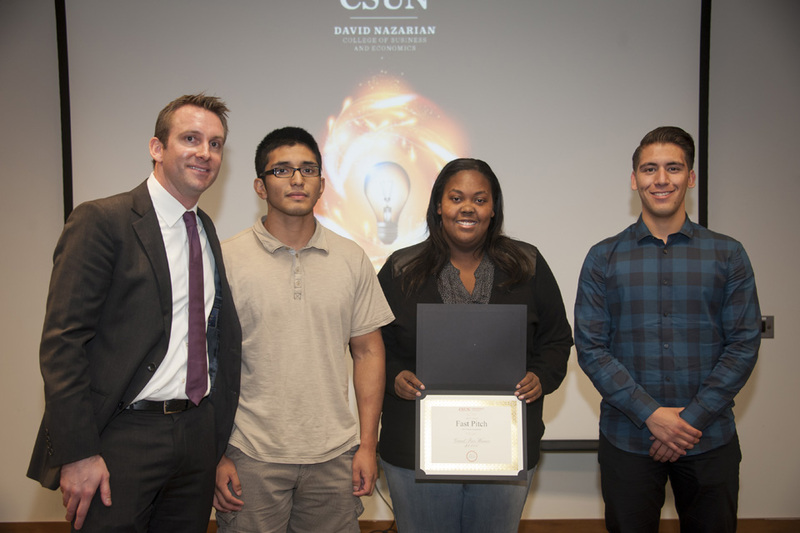 Sobhe, along with Tracy Gray, Alan Campos ’16 (Business Law) and Russell Weissman ’06 (Cinema and Television Arts) had a tough time naming the winner of the second annual Fast Pitch event, a competition where 10 teams of CSUN students had three minutes and three PowerPoint slides to pitch their new venture idea. In the end, the panel awarded the $2,000 grand prize to WebApes, a trio made up of CSUN students Edgar Limon (Marketing), Arvin Flores (Marketing) and Jasmine Beeman (Communications). The group pitched a smart script internet code they are developing to help the visually impaired better navigate through websites. According to the group, most websites are set up in a way where people with visual impairments are unable to read the text on websites. Their goal for entering the Fast Pitch competition was to see the kind of response the idea would elicit from the crowd, Flores said. After the competition ended someone gave him a business card and said they were interested in using the script for their website, Limon said. More than 120 people filled up the Ferman Presentation Room inside the Oviatt Library, according to Entrepreneurship Program Director Ryan Holbrook. 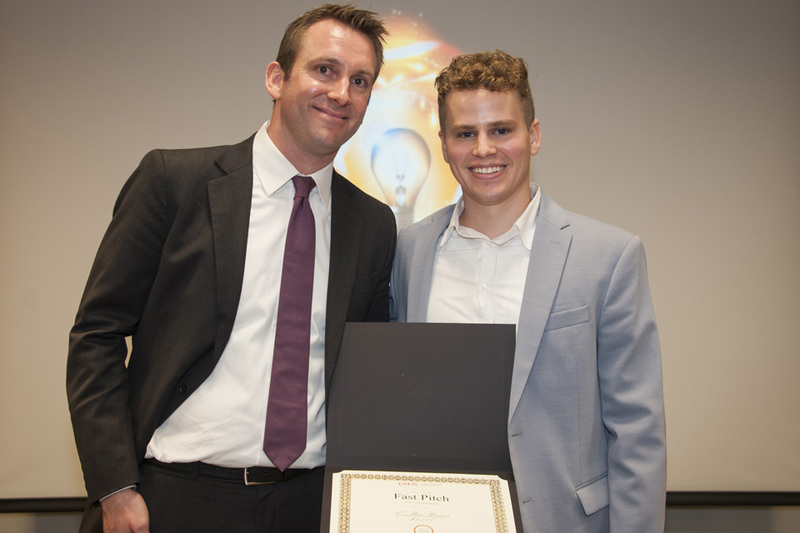 Coming in second place and winning $1,000 was Steven Van Alen (Management), for his Sleepy Head foam mattress and topper startup. The $500 third-place winner was Luis Turcios (Economics), Carrie Huang (Marketing), Denise De Sequera (Management) and Luke Rimando (Financial Planning) for their Fit Us mobile workout app. For more information, visit the Fast Pitch website.